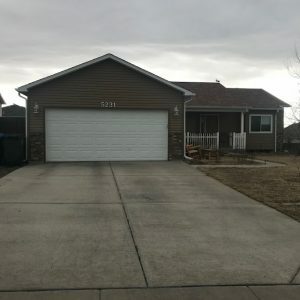 5231 Danielle Court in Cheyenne WY is coming soon to the market! Don’t miss this beautiful, quiet, three bedroom, two bath home with wood laminate and tile throughout! The bedrooms are larger than usual with a very large master. It has a newly updated roomie kitchen with all new stainless appliances and solid surface kitchen counters. You’ll love the fireplace and beautiful mantel for your family photos. Great display shelves for collectibles above the kitchen and living room. The eat in kitchen will make family time great and there is an optional dining area that leads to the back deck of the fully fenced back yard, or it can be a massive family room. The basement is not complete but has been framed and has some insulation. Everything is stubbed out for another bathroom. A heated two car garage and space outside to park a boat or camper. 5231 Danielle Court is a must see, move in ready with room to expand. This home is located in the Summitt Hills addition off Ridge Road and Carey close to Dell Range and shopping! Similiar listings include 5208 Danielle Court and 5214 Danielle Court. Contact Eileen Sivley to be the first to check out this adorable house! Her market knowledge and experience will guide you through the process of buying a home. This home goes live on Friday, March 23, 2018!